RML Suite of Visual models templates for business analysts, ready to use and free to download. The .zip file of our full RML suite includes 22 different business analyst templates (Microsoft PowerPoint, Word, Visio, and Excel files), all of which are outlined and explained in the book Visual Models for Software Requirements. Simply submit your information in the form to the right to initiate the download. Modeling languages help analysts, designers and developers to design and create complex software systems. Two widely used modeling languages are Unified Modeling Language (UML®) and Systems Modeling Language (SysML). Here at Seilevel we use a Requirements Modeling Language (RML®). RML approaches software from the business analysis or product management perspective and focuses on specifying needs, rather than the solution designs like UML and SysML tend towards. Instead of focusing intensely on complex system design models, RML looks at a project’s goals and objectives. RML then uses models to break down these objectives into requirements which are easily understood by both business stakeholders and developers. By focusing on objectives instead of system design, RML forces teams to hone in on designing systems which maximize value to a project. UML and SysML are very useful modeling languages for designing and developing systems of course. The RML models actually can be used as a starting point for many of the models within UML and SysML. 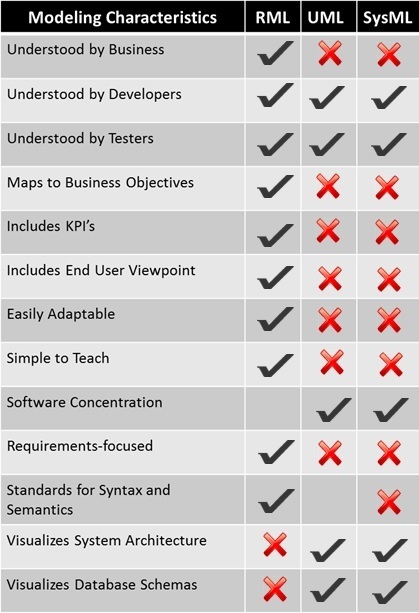 See the chart below for a full comparison of RML, UML and SysML. These templates, based on our RML as written about in Visual Models for Software Requirements, are free to download and ready to be used on any project. After submitting the below form, a zip file will download that includes 22 different models in various Microsoft Office (TM) applications.